The warmest space in our house is my lofted sewing area. Originally intended as a family room, it is long and narrow and completely open to the downstairs where a wood burning stove is our primary source of heating. 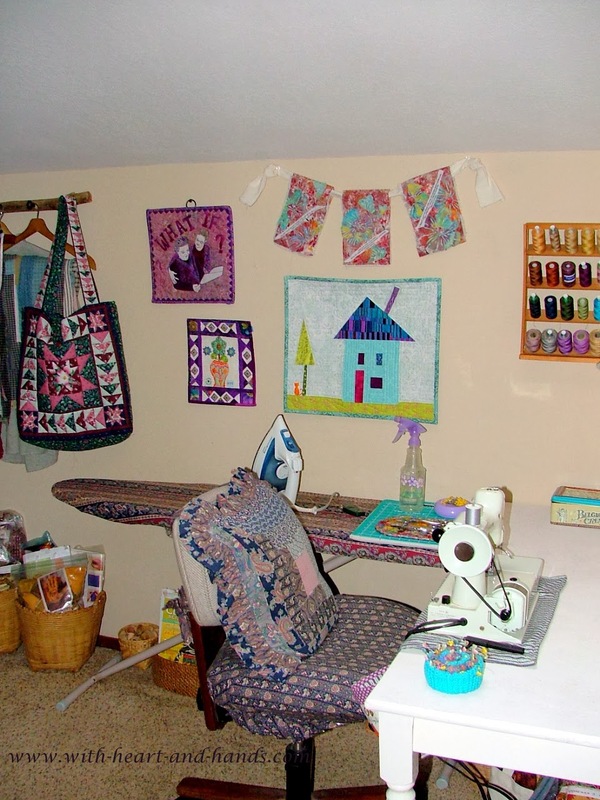 But that long and narrow lofted area ended up being perfect for quilting, as I have not one, but two spaces for quilt laying and pinning and the little storage space at the end is now used as my little sewing nook. We've lived here since 1978 and for the past almost four years without a working heat pump..oh yes, "carpenter's wife", I am married to a builder ;-) And while using a wood stove as much as we do involves a lot of tree and wood chopping, stacking, wheelbarrowing, and fire making, it has made for toasty warm heat during our cold winter season. And it's economical and environment as we constantly have trees downed by windy storms! Luckily, we finally decided to replace our aged and dysfunctional heat pump with a new one in late fall because it was in the nick of time for a huge cold spell here in Oregon. Even with a wood stove, its nice to have the heat pumps regulated fan blowing our warm living room air into other areas of the house a little more! 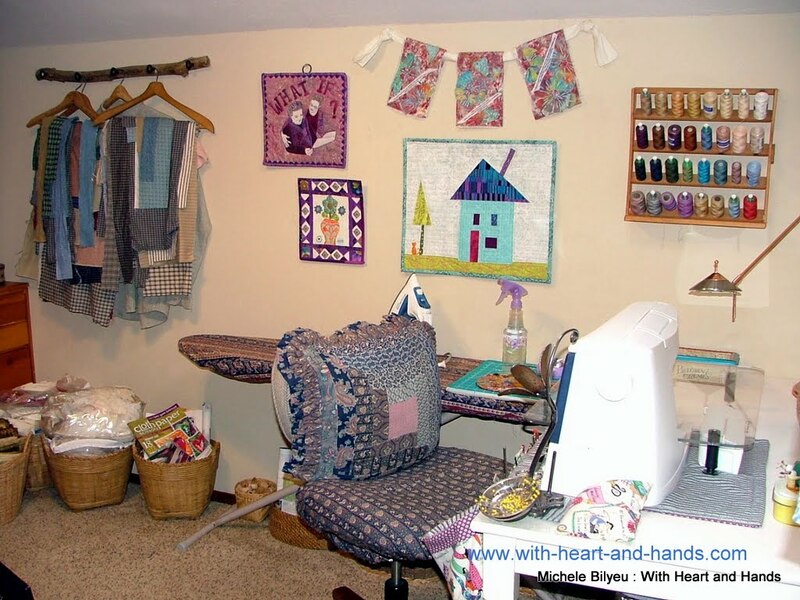 And my sewing loft, and especially my little sewing nook are so toasty warm now that I often have to wear short sleeve shirts even in the midst of winter, whereas in the rest of the house I am wearing a fleece coat! Salem hit 8º and it was colder to me...both inside and out...then all of the years of being up in Alaska in the Juneau area and in my childhood home on Douglas Island. Maybe it was because I was so 'mind over matter' busy helping my mom and dad when they were both alive. Our kids in Eugene hit -10º, and our friends in Central Oregon went clear down to -27º. So, that news warmed us up in a hurry. 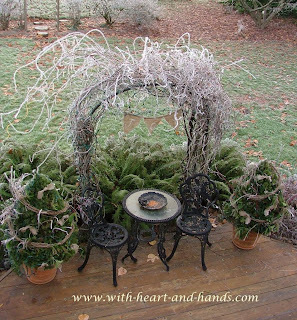 You might feel sad or even 'frosty joy' where you live, but someone else might be sadder (more sad) or chillier still! It's getting to feel a lot like Christmas at our house. I make most of my gifts for others, and besides, sewing upstairs was the only way (besides wearing a coat in the house!) to really keep warm. And so, I have been extra, extra busy sewing! One of the saddest things that I discovered when both my father died in August of 2010 and now my mother passed away in 2013, is that almost no one sends paper sympathy cards anymore. In fact, with two exceptions...only two of my real live friends did after my mom's passing this September.. When my mom passed away, not one person sent flowers, brought over food, or came to visit. 8 long years of Alzheimer's Disease had taken its toll, not just on her, not just on us as her caregivers, but on any friends she might have even had left by the time she reached 88. No one could cope with her changing so much, much less seeing her totally bedridden and unresponsive near the end. I literally drove around our tiny town, and stopped at one of her friends' house to tell them she had passed away. They changed the subject and even after an entire hour of visiting never once told me they were sorry for my loss! I realized then, if I had never truly realized it before, how hard it is for some people to deal with loss and harder yet to deal with someone else's. They are just plain too afraid of feeling the triggering of any pains of loss they might carry from their own lives. So, they wall their hearts up and try not to feel or to talk about it. 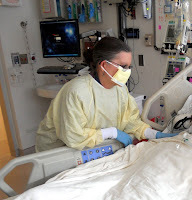 After years of doing a volunteer lay therapy of hospice for those in intractable pain and/or dying, I learned to not be afraid, in any way, of the dying. And with my parents, and my mother in law, not to be afraid of being with them, or hold or kissing them even after they passed. I still love them just as much, they just appear very, very different. But the love..it is just the same only yet deeper, still, because now...we finally truly realize what the loss of them means to us and to our lives without them. It really hit me, just how much some expression of caring truly meant, and I vowed on both occasions that I would never not do something when I heard of someone I knew passing. And yes, it is often paperless, flowerless, food less (as in email or facebook) but I at least do something! I know I appreciated SO much when bloggers left comments here, or on facebook, when both of my parents passed. Those comment meant the world to me and I read them again, and again!! 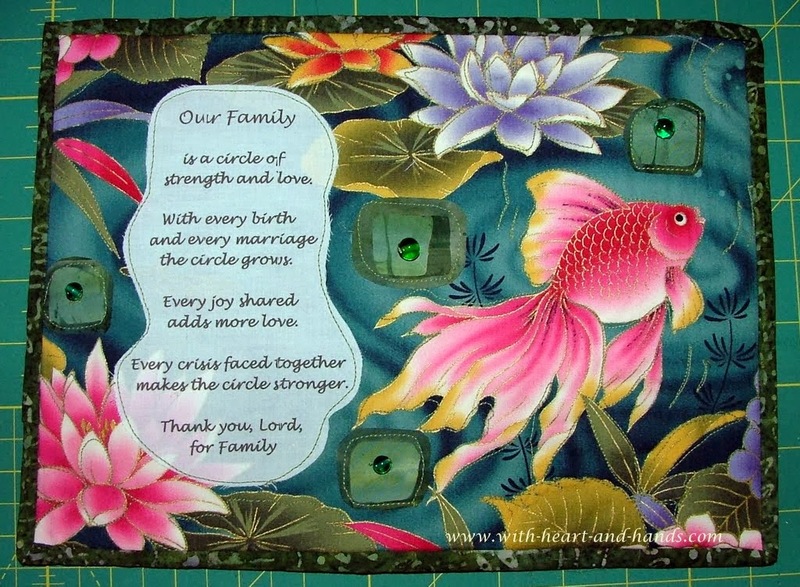 So, a big chunk of my sewing is the making of either small format art quilts used as 'empathy cards' or small, easy to make 'prayer flags' that I give instead of cards. Above are two hanging prayer flags I made for friends, and I have made similar ones since, for other friends that will be given away soon. I lost my best friend in a horrible, horrible car crash in 1997. She was just 46 and her daughter who also died, was only 12. The mother was my best friend since college in the late sixties. The daughter was my own youngest daughter's best friend since birth. They were on their way to the Jr. Olympics where our precious little 12 year old friend/third daughter, was to run in, and expected to win her division in Florida, that year. She was that amazing and that talented and that very, dear and special. We built our houses next door to one another, and each of us raised 3 children, each and every single day for over 20 years..side by side. I know loss of many kinds and they are all painful and all challenge us to the core. But that death was the hardest of all, her husband and two surviving sons were in the car and witnessed the loss of their mother, their sweet and incredibly talented, young sister. I cried every single minute for the first 24 hours until I had no tears or heaving sobs left in my body. And while the grieving lasted a very long time, as I sought to help the remaining family deal with theirs, in time it all eases, and all of the memories and all that you have learned from the experiences fill up the empty spaces, instead. 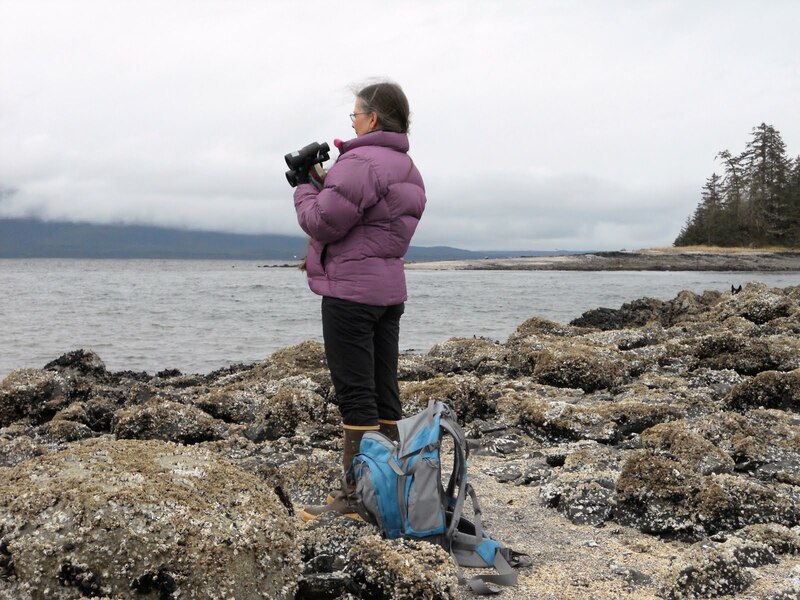 I learned so very much about loss, about grieving, and just plain about grief from that experience. I learned that it was only by believing that there was a purpose to this challenging journey and that by doing for others that I felt better. So, I helped that family every single day for an entire year. And I learned that by doing for others, my own losses, my own pains were made easier and more bearable. It was a different kind of mind over matter than I had been learning and practicing with years of meditation, many forms of yoga, ch'i gong, and other forms of transcendent mind, body, and spiritual practices, as well as my own form of spiritual practice with prayer. 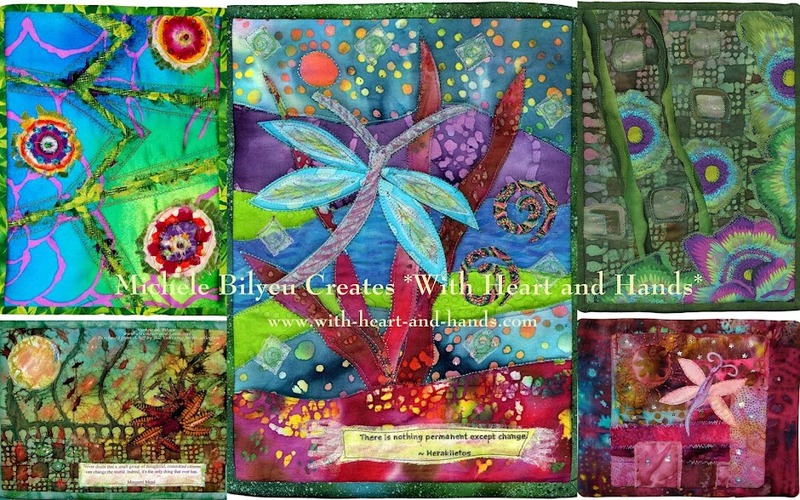 And I learned about the making and sharing of prayer flags and the my own prayer filled small format art quilts. 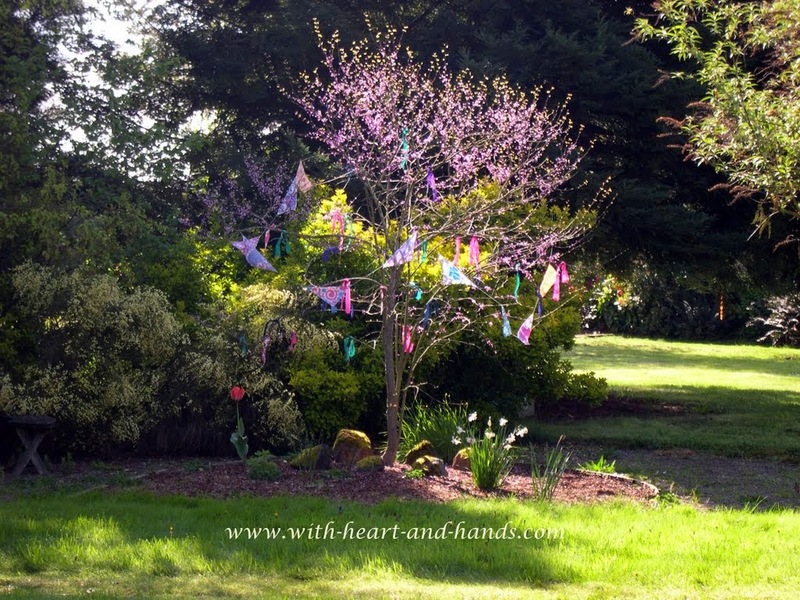 Above, are the silk prayers flags that I dyed and printed and hung out on the little 'sweatheart' tree with its heart shaped leaves, that we planted between our two houses. When my brother was expected to die in early June of 2012 and I rushed to Anchorage to be with him and say goodbye and then he miraculously survived, I followed him through 3 states and 4 hospitals until he was restored to full health. Again, my own form of mind over matter and putting love into action and not just reaction. And when his wife became in desperate need of a kidney transplant (still does...Blood Type O+ with high antibody titers) I helped her. She moved south to be near her husband and together, we did everything we could for him. 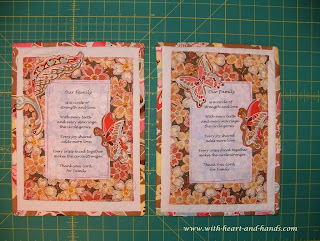 And still I found time to make each of them a little fabric art card/quilt and those little cards were in both of their hospitals room to room to room. When I couldn't be there with them, a part of me and my love for them was..it's that simple. So, when my mother died, and suddenly, there were only a few family phone calls, no visitors, and no cards, gifts, or food. So, we gave each other cards, made each other food (and yes, we were mostly all within two houses!) and gave lots and lots of love, and hugs. 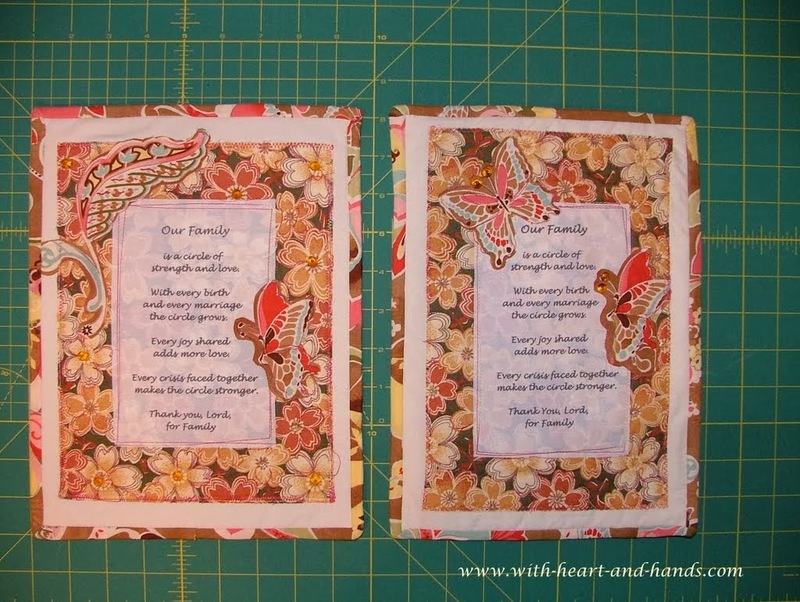 And as soon as I could, when I was back in Oregon once again, I made the little fabric art card quilts shown above, and mailed them to my families in Douglas. I needed them to know that even while I was deeply grieving, myself, I knew that they were, as well.And each of them includes the Our Family/Prayer Poem that reminds us always of the importance of family and the cycles of birth and death within them..but in a good way! 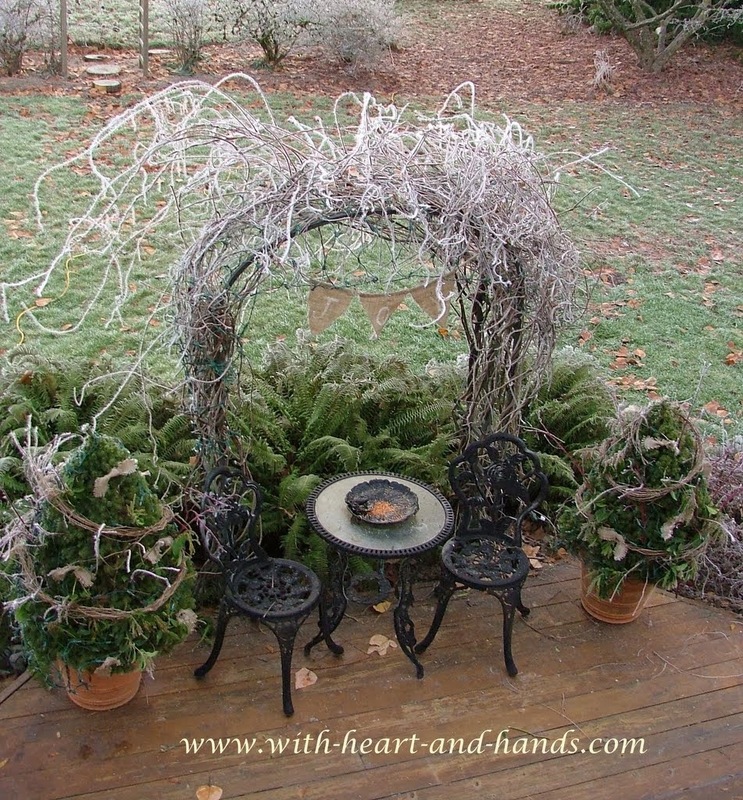 Now, here in Oregon, it hits below freezing and I still needing to keep really, really busy. When I am busy, it takes away a little of the horrible stabbing heart chakra pain one feels after a deep and grieving loss. 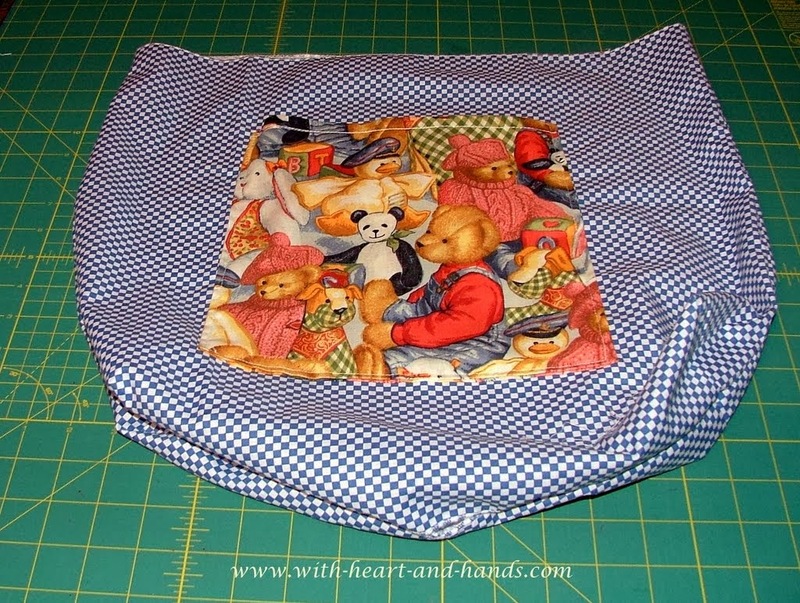 So, up into the sewing room and sew, sew, sew. Or onto the computer and make and redo and update all of my kazillion free links and tutorials. It keeps me focused and gives me breaks from the pain..both emotional, and my own long term chronic pain issues that doctors once told me would put me into a wheelchair wihtin ten years. Well, it's been 33 years now, and I'm still going strong! So, much for their predictions and my own ability to use my own deep beliefs and my energetic mind over matter abilities as I do! But it has been cold here and cold is cold! I am suddenly wearing a coat in the house, two coats ..one on top of the other...when I go out to check out, feed, or continually replace frozen water with fresh for our chickens, wild birds, and any foraging feral cat, raccoon, deer opossum, or skunks! 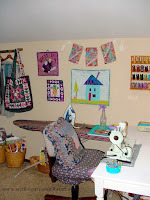 Sew, up in the sewing room I have been! And the warmth of the wood fire drifting upwards, the humming of my sewing machines...I was using three at once.....and the glow of the Christmas tree lights and garlands have only intensified rather than ruin my lovely Christmas cheer. I always make a huge number of our Christmas gifts, but show them later rather than sooner due to wandering and wondering eyes that might here, appear! She had her first chemo treatment last month in Seattle, and the very next day, a wonderful Thanksgiving dinner with a brother who lives near Seattle, then home to Juneau on Thanksgiving evening and another meal with her other brother in Juneau, and then another one of my brothers and his family in Douglas the next day on Friday. Thanksgiving is her very favorite holiday and she had 3 Thanksgivings in 2 days! You tell me that was not meant to happen, they certainly did not plan it that way. But yes, Shelley got 3 Thanksgivings. Please do keep her in your thoughts and prayers. She just recently found out that she is to be a grandmother for the second time and would dearly love to live long enough to see the wee one be born. Shelley loves teddy bears...I actually have three dear friends who love teddy bears. We all have an inner child that needs love and comforting and teddy bears certainly represent that to many, and they end being gifts for young and old alike, as well as being brought to hospitals. 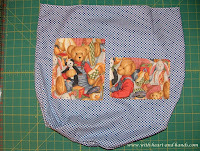 So, another teddy bear bag with teddy patch pockets inside on both sides, as well as outside. 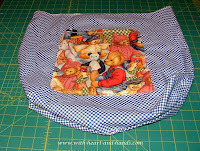 For Shelley, who loves teddy bears, one of my teddy bear bags to bring south once again on the 19th to have her second chemo. 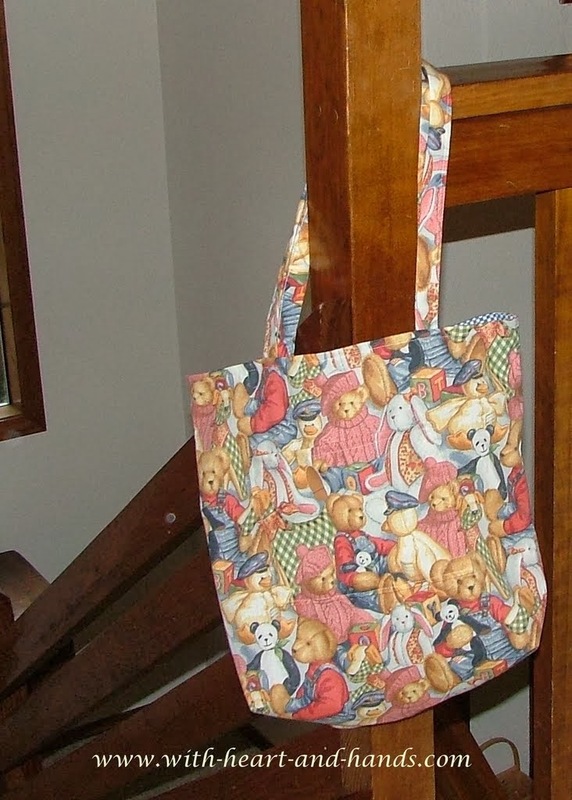 My little bear bag has three big inside pockets to keep her cell phone, or lists, or perhaps a trinket or two that comfort her during challenging times. My note card was filled with love and hugs and I told her to fill up the bag with lots of gifts from her to her beloved little granddaughter in Tennessee and the future little one in Washington state to bring with her when she visits them. 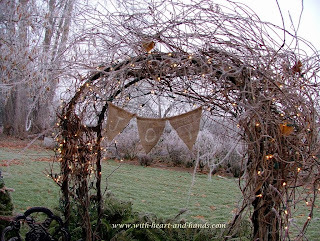 And for myself, this simple little garland of burlap and muslin...to remind me that there is always great joy, it's just up to us to bring it forth from within the cold and frosty energies into the warmth of the interior ones of the heart. No matter what happens to us, to our earthly bodies, our love, our spirit, our soul lives on. Let it live within all of you know, and share that love with others while you still can. Your post is very moving, Michelle. I'm in the UK and I received wonderful cards when my mother and then my sister died but what I really appreciated was the letters - words remembering them, remembering shared experiences and remembering what each of them had said about me - things I had never known. My mother had dementia just for the last few months. Thank you for sharing all that. I think sometimes people are afraid to communicate after a death because they think they will say the wrong thing and hurt the person even more. It's very hard to know what to do, so we do nothing. It's very sad but true. I hope Shelley does well and sees her new grandbaby. Thank you. I have just re-read my reply and was worried that it sounded smug but what I hoped is to remind anyone else that there are practical things we can all do, even at a distance. You give a little of yourself to us in this post. I never really thought about how important it is to acknowledge the passing of even an acquaintance's loved one until my own mother passed. I was amazed at the comfort I felt when neighbors visited the wake. I never really thought about how some people feel about giving condolences. Our generation was taught a different version of etiquette when it comes to greeting cards. Younger people were raised in a digital world and rarely even make a phone call when they can text instead. So I gratefully accept any communication I get. I have found that sometimes it's quite hard to take the first communication step. Stay warm!! My neice lives in Beaverton ( is a designer for Nike) and my nephew lives in Washington (an engineer for Boeing). I never knew it was so could in that area. Our northern Indiana winters all seem to depend on La Nina or Le Nina. This year its cold and snowy so far. Thanks for letting us know you a little better. I don't know how you challenge (?) people's fear of death. Your post is a touching reminder that we need to realize this is not about us and reach out to others. When my mother died I received few cards but got a lovely flower arrangement from my dentist, a woman. I let her know how much that meant to me. She was a great dentist too. A wonderful post on how we should be sharing our lives with each other. I'll be sure and pray for Shelley and that she has time to met her new grand baby. 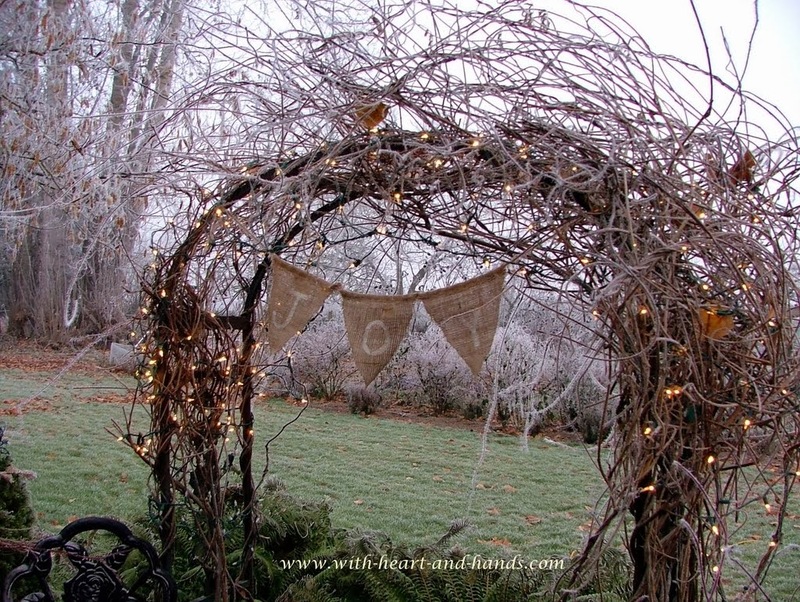 Michele, this is the first time I've seen your blog and this post brought tears to my eyes. I truly understand what you are saying about loss and our grief. First I want to say, thank you so much for sharing! I found your blog when I was searching for information on the Daisy Kingdom in Portland, Oregon! I used to love going there and was so sad when it closed. I was wondering when it actually did close, so went on a search, and found your 2007 post on making an apron from one of their patterns! Then I was so intrigued by your blog, since you live (part-time?) in Salem, Oregon, that I decided to do a little exploring of your blog. I am blown away by how much you do for others.. and how much you give. 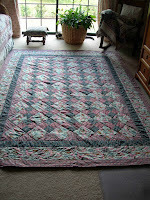 I have been a quilter and seamstress all my life, and have always wanted to do more sharing of the things I make. When I lived in Vancouver, WA (not far from Salem) I was with a quilting group who made quilts for hospitals and children at risk, or foster children. 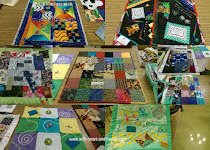 I helped with some of those and I also volunteered to help teach a class once a month to children at risk (mostly teens), and they learned how to make simple things like pillow cases, bags, etc., but also learned how to make quilt blocks, and we would make about 15-20 each Saturday, and then they would be put into a quilt by the other group's quilters. Those teens loved doing that! The spirit of giving needs to be taught more to our young people as I think it's been lost over the years. I am definitely going to follow your blog. I want to "give" more... I am now also into scrapbooking and am going to join a group who makes cards for the military (blank ones) and we send them to them so they have cards to send to their loved ones. 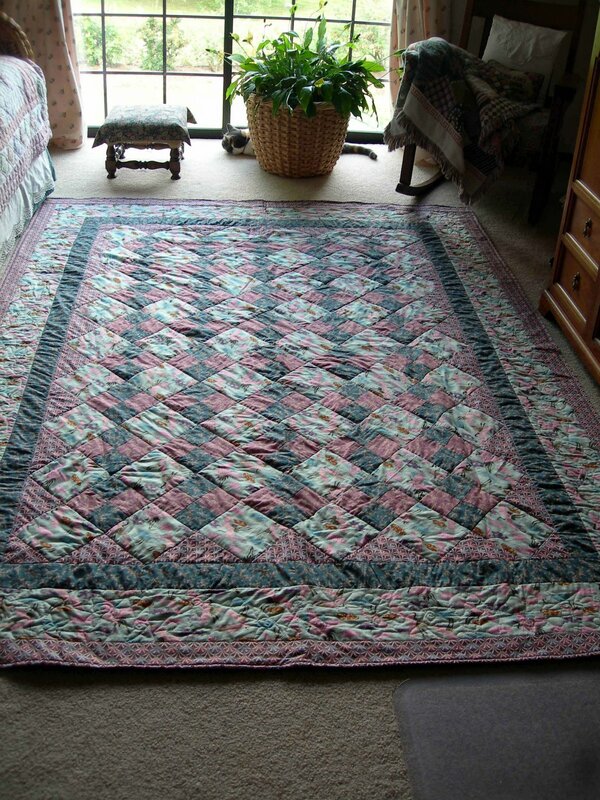 I would like to do more quilting for hospice and hospitals. I understand your grief with the loss of your friend. I have lost both of my parents, 12 years ago, and thankfully most of their friends were still sending cards and flowers which us sisters appreciated so so much. We loved hearing stores about our parents that we had never heard, and I've been on a search since then, in contacting their other friends and relatives (few are still alive) who may have had photos of my parents that I never saw. There has been a great outpouring of photos and words written, and I'm so thankful. My most horrible loss was of my 24 year old son 4-1/2 years ago. I just want to concur with you that the things that mean THE MOST to us are when someone talks about our child (or friend or parent) and tells us things they remember about them, that we may not have known. Too many people kept silent and didn't say a word. I think they were afraid to talk about my child, for fear it would bother me, but just the opposite, WE WANT TO HEAR about our loved one.. in any way possible.. hear what they did, said, liked, or talked about. We crave to hear any little thing. I hope others who read this blog post and our comments will see that when we lose a loved one, we want to hear others talk about them, and give us more memories to cherish. I was VERY SAD when my own sisters never hardly said a word about my son, or how sad they were for my loss and his loss. That broke my heart. We do need and want others to talk about our loved one. We cherish and treasure any handwritten card, note, trinket or thought.. and we especially love getting something special on each anniversary of their death, acknowledging their life and what they meant to others here on earth. I have one cousin who, each year on the anniversary of my sons' death, sends me a card in the mail, or an email, telling me how sorry they are for my pain. That means the world to me! So others who read this, PLEASE acknowledge that you understand the person's loss when someone's child or parent or friend dies. It means the world to us. Sorry this is so long. I just wanted to agree with you wholeheartedly, that we need to recognize and acknowledge the pain of loss that others feel when someone they love leaves this earth. Oh, Michelle...cold place to live for you...but such a warm heart you have. My mother raised me to handle my pain by doing for others..it is really the only way. Hi Michelle, your post is so heart-ful and moving. In this Christmas season, I've been thinking about my Mom. I still miss her after she's been gone 5 years. I'm so sorry you lost yours just recently. And yes, being busy and giving is a sure way to get through! Thanks for posting so much of yourself. 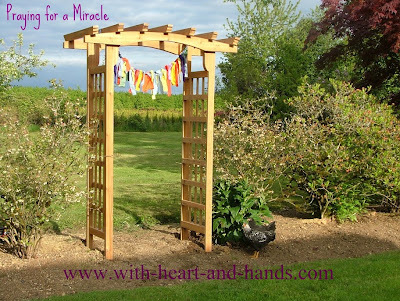 What a wonderful post Michelle, so moving. You certainly can write. I'll light a candle for Shelley & remember her in my prayers. Have a happy Christmas Michelle. Beloved - copper pot and lilacs Looking cloth. roots. Birds above....what below? More new threads - they are all out there basking in the Sun waiting for the winder to come home and see to them. .